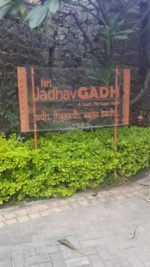 You have been reading about the delicacies that I have been savouring at various ITC restaurants, and this time, I was invited to review their spa. Many of you may not know but I am a complete spa connoisseur. No vacation of mine is complete without a trip to the spa. I am sure through the course of this blog you will understand what I mean by calling myself a connoisseur. Kaya Kalp means the ‘rejuvenation of the body, mind and soul’. India’s true spirit lies in its traditions and this year I have decided to adopt all things that lead me to that path ie #BackToTheRoots. So that’s probably my reason to head to this one. Location: The spa is located just a few minutes away from the Mumbai International Airport, within the ITC Grand Maratha. 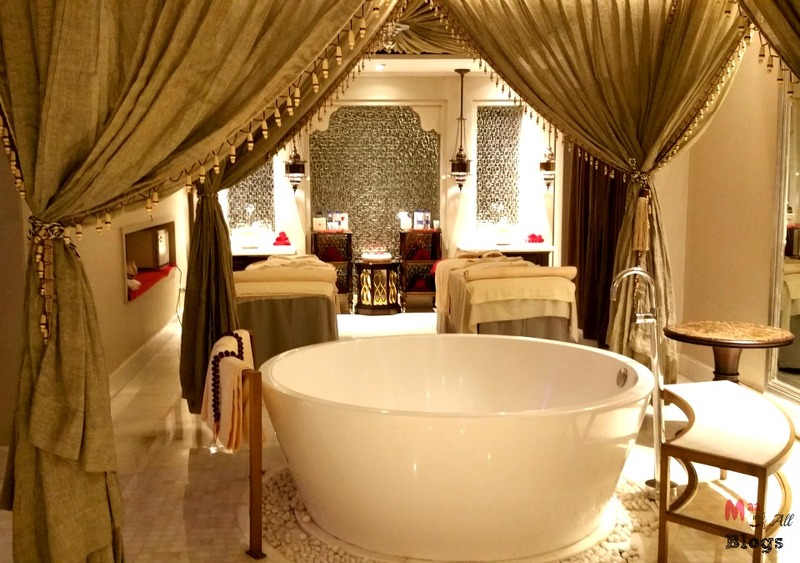 Ambience and decor: The Kaya Kalp Spa at the ITC Grand Maratha is spread across an area of 9000 square feet.The decor is highly inspired by the Mughal architecture. Aesthetically, the spa is stunning. But not in an over-the-top way. More in a mindful, no-details-spared way. Striking artwork welcomes you at the entrance and beckons you along. As you make your way deeper into the spa, the light softens and the mood created is just right. There is absolute silence in the pathways, so as to not disturb the guests in an ongoing treatment. In salutation to Emperor, Babur, the pomegranate fruit has been adapted as the theme. It is widely believed that Babur was responsible for bringing in a variety of fruit-bearing trees including the ‘pomegranate’ to India, from his homeland Ferghana. 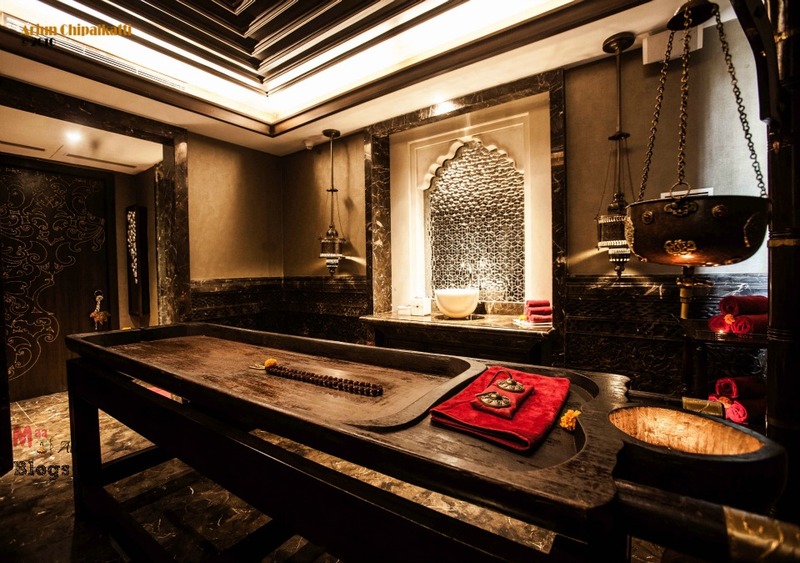 The entire spa is laden with stone latticework & pomegranate pattern in silver leafing adorning the wall. Rooms and facilities: I was led along the hallway to my first stop — The suite to die for is the lavish couple’s suite which includes a contoured soaking tub; parallel treatment beds for simultaneous therapy, private showers and a relaxation sofa transporting guests to a blissful state. Just have a look, doesn’t it look absolutely divine? On my way, I also noticed provision for various other treatments like the pedicure, hair spa etc. The Spa has five singles, one superior couple’s suite, one standard couple’s suite, one Ayurvedic suite, and one Thai treatment suite. Three relaxation areas, men’s and ladies changing rooms, and wet areas with steam, sauna and Jacuzzi to suit the needs of all and sundry. Nuances: While I chose my treatment in the waiting area I couldn’t help but notice a warmly colored room lined with couches and puffy throw pillows. I missed my herbal tea which is usually served before the spa treatment, which my therapist explained is advisable to be had after the treatment. I am always on a look out for a differential experience and was recommended ‘Kaya Kalp‘ by the therapist which is their 60 minutes signature massage. Treatment Room: Finally, I was shown my treatment room. Outside which a lotus quilted hanging caught my fancy. Lotus is the national flower of India and another chosen motif of the ITC spa. I entered a dramatic alcove centered by a ruby-colored pedestal chair illuminated by twinkling fiber optic lights above. The spa room looks like the fabled India that traveller from across the seas wrote about in their memoirs. The warmly appointed, dimly lit room was elegant yet simple and every inch hinted of forlorn luxury. Kaya Kalp Treatment: I was left with a change of disposable clothing, a robe and to settle into a lounge chair. 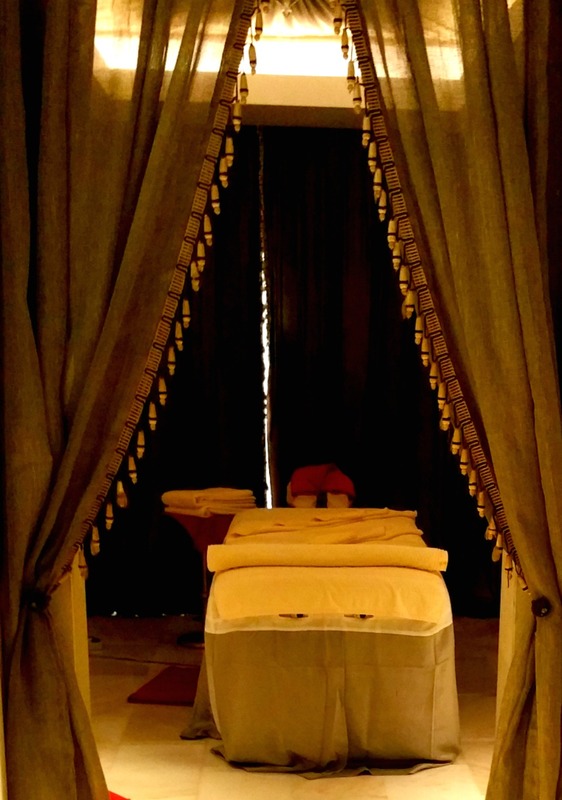 My therapist performed a small foot cleansing routine, which just sets you in the right mood at the start of a treatment.The bed looked inviting draped in exquisitely soft linens and was temperature controlled. The music playing soothed my senses. She also checked with me on my choice of massage oils; Stress soother: the sandalwood oil, healing: lime and ginger and muscle ease: eucalyptus and pepper. She also checked with me on my choice of massage oils; Stress soother: the sandalwood oil, healing: lime and ginger and muscle ease: eucalyptus and pepper. My choice was clearly driven by my mood for all things royal and stress relieving, so I chose the sandalwood oil. My therapist was skilled at seeking out my rough spots. The signature massage is inspired by the Swedish technique and the therapist used cupping and thumb pressure techniques to sooth my aching muscles and calm my senses. It was an unusual technique and unlike what I had tried earlier. The pressure used was medium and not overbearing at all. Bath, Steam and Sauna: The steam, bath and toilet were inside the treatment room, which is such a relief. I hate to head there before and after my treatment as it breaks the whole aura. If you intend to use the sauna, you will have to head to the common area. All toiletries, hair dryer, combs are all well stationed in the changing area. I did miss a locker for my valuables, though. Looking back on the overall experience, taking a few deep breaths and being overcome by a feeling of peace, of appreciation, sleeping off at the end of the treatment. My therapist was considerate and let me doze off for sometime. These minor things always add to my experience. Value for money: While usually the spa is only opened to the in-house guest. Monday to Friday, ITC has started bliss hours in which as a non-resident guest, if you book the spa from 9 am to 3pm you get 30% discount on some select treatments. You can also book a one-year spa package in which you get 10 vouchers for 10 hours of treatments. These treatments cost around INR 50,000 but as a part of the package it costs only 30,000. Exotic treatments that you should try: The Spa offers various treatments including exclusive Spa Journeys, inspired by the Pomegranate and Ayurveda. A unique combination of natural fruits such as Pomegranate- which is a deep cleansing antioxidant & lime, mixed with organic brown sugar, allows the body to be gently exfoliated. Not only does it have a cleansing effect, it also removes the stresses of our daily living. Using a powerful blend of traditional oils, the mind is guided into a rested state which induces a sense of peace. This divine state of well-being is then enhanced by the vigorous workout of the therapist’s hands using amazing deep rhythmical movements. p.s. While I was invited to review the spa, this is not a paid review. « How to be romantic on Valentine Day with kids hanging to you like attachments ! Thank you 🙂 the decor is indeed very enticing. 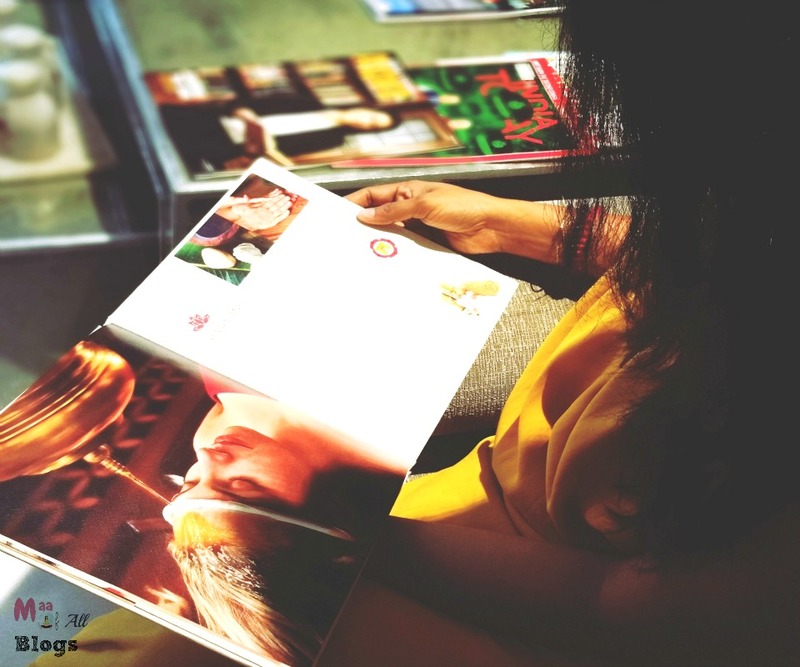 Thanks Archana…so when are you heading there? Looks so divine & royal.. And I love how you have penned down your experience. I’ve always had a thing for decadent, period hotels and ITC Maratha seems to be just that. The spa decor and the professionalism speaks for itself. Great details found in the review! Looks like a great spa and your pics are nicely taken.